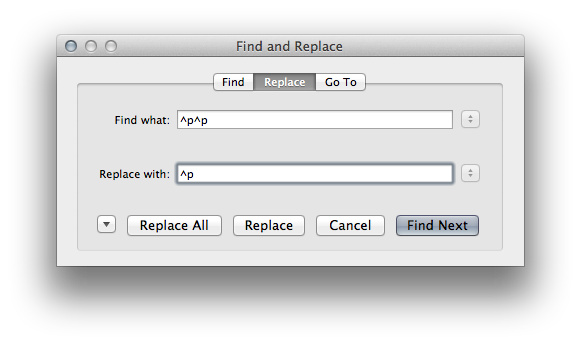 This may seem more obvious to some than others, but if you’ve only used the “Find and Replace” feature for words, you may be missing out. Any time you come across a case of needing to repeat some corrective formatting more than a few times, it could be an opportunity to automate the process. Maybe you need to remove all of the bullets that came over from another document, or maybe you need to turn two paragraph returns in to just one. These kinds of formatting fixes are common when moving from basic text formatting (like an e-mail) to proper publishing (like a newsletter), for example. Built by Justin Wills using Ecobox, by Dan Fisher. All rights reserved.